Garden Patch Gut aka Paua Gut? Hmm - what a pleasant sight upon which to feast the eyes on a grey late May morning. Not a problem, FL. I assume your offer to upgrade all Gold Members to 30 inch Apple Cinema Displays is still valid. How far is the 505 from a ramp, as I've seen a couple of trailer boats out that far. Had an ally cat cross directly in front of us, on the Garden Patch, and hook a Blue! And its the same distance back - worth bearing in mind if the winds for the day have any West in them. and I can tell you this. Its a long trip back when the wind comes from the west and you are in a trailer boat. 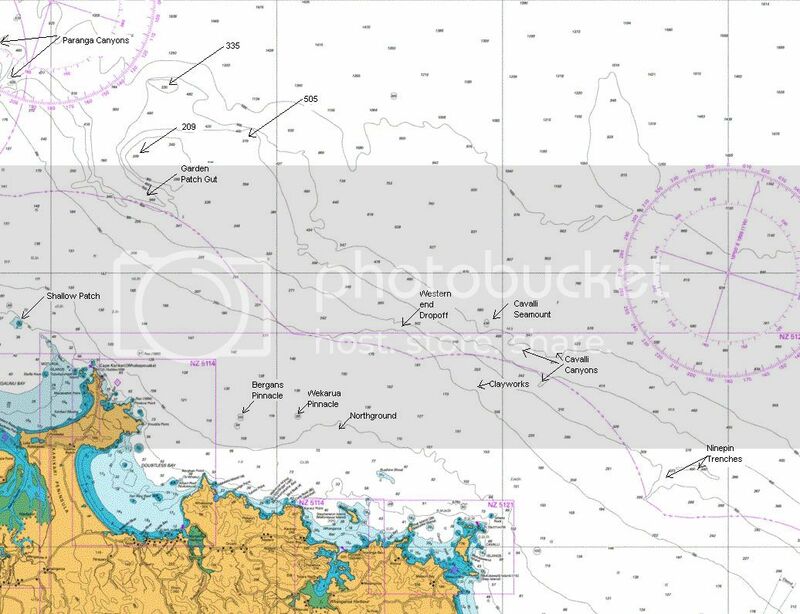 Yeah the waters around Karikari can get snotty, when you get the water coming out of Doubtless and also coming out from Houhora meeting around off Karikari there, with a NE swell hitting the rise around he Garden patch, the seas can get steep. Not nice in any boat let along a trailer boat. The area names are not very hard to figure out why they are called them, except for maybe the Clay Works. This got its name because to find it in the days before GSP's you had to line the Clayworks on the hill at Matauri bay up with the end of the bay or something and head out to the 200m line (I think). I think it's the tip of Little Step Island? You could add Maramahuta to the map. It is on the 100m line directly into Doubtless from the Berghan pins. Is an old hapuka spot that also produces Marlin & Mako. Also I think you have Cavalli seamount around 35-40 miles too close in (by my reckoning is around 68NM out) It is a big day in a trailer boat. Cavalli Seamounts and the 60mile ground one and the same?...Adam?? No its not, the 60 mile ground would be a hell of a day in a trailer boat. the sea mount is outside the dropoff in around 600m and you can actually see it on the map. I didn't think so either Adam.....just wanted to get some clarification on Odin's post. I assume it is the 60mile Ground you are refering to that is 68miles off the coast?? I have fished out there with Primetime and you are right it is a bloody long way, where as the Cav Seamounts are much closer. A. Scott $1.07 - not worth the investment. This is the grounds you're talking about Odin. Have you seriously fished them in a trailer boat?? Got bigger nads than me thats for sure! In a straight line from Houhora, how far is that? Put it this way, you can see the lights of downtown Apia! I remember "that" spot very well indeed....busted my marlin, spearfish and mahimahi cherry right up in there.....great days.....I am sure re Plonker will chime in here with a comment about "crispy potatoes". Pig...it is about 60miles to the first hill then 90 to the next...the King Bank would be closer to Houhora I suspect!! distance from Houhora to Compass Rose please Kerren ? will have to check that from home mate.....but I would say about 40nm!